This cocktail hour brought to you by the East Hollywood Farmers Market…. 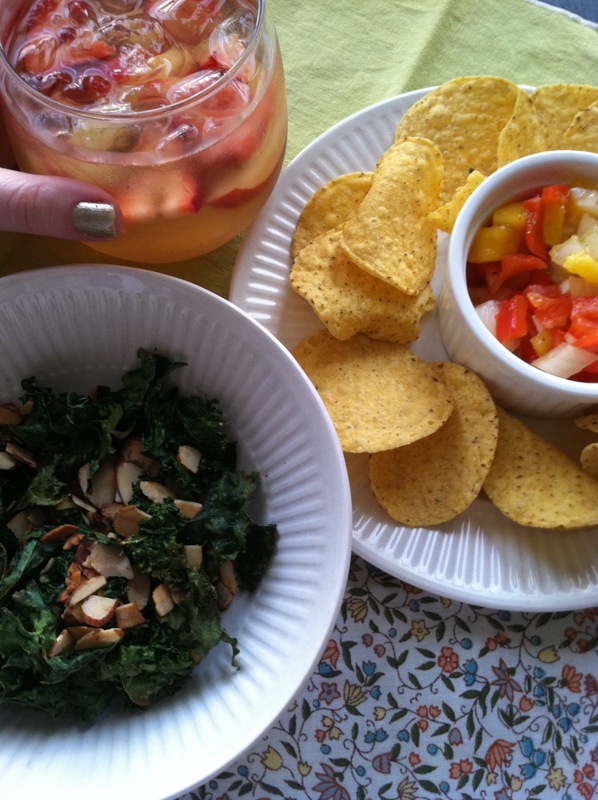 Strawberry white peach sangria, mango salsa, kale chips with toasted almonds…. slice the fruit in thin slivers. Layer the fruit in the bottom of a 2 qt pitcher, alternating with sprinklings of sugar thusly: layer of half the peaches, sprinkle of sugar, layer of strawberries, sprinkle of sugar, half of the lemon slices, sprinkle of sugar, etc, until all fruit and sugar is used. Cover the pitcher with plastic wrap and allow fruit to macerate in the sugar for 30 minutes. A fruity, delicious syrup will form at the bottom and you won’t see any sugar granules when the syrup is ready. After the sugar granules dissolve, add the bottle of wine and the brandy. Stir gently, and chill for an hour. Serve over ice, topped with a splash of sparkling water, ginger ale, or sparkling wine. This is great on it’s own with chips, or as a topping for scallops or fish. You can add a diced cucumber, or some pineapple, too if you have them laying around. Peel and dice mangoes. Dice red pepper, onion, and jalapenos. Toss fruit and veggies together in a bowl with the juice of one lime and allow to sit, covered & chilled, for 20-30 minutes. Salt and pepper to taste. Preheat oven to 300 degrees. Toss kale pieces in oil and salt & pepper to taste. I like my kale chips to have a salty bite, so I use about 2 tsps of kosher salt, or 1 tsp of table salt. Spread out kale pieces on 2 large baking sheets, so they don’t touch, and bake in the oven for about ten minutes (but I start checking on them after 8 minutes). You want them to dried out, but not burned. Remove from oven and cool. Spread almonds in a large skillet and place over medium flame. Swirl the pan to keep the nuts moving, slowly. When they start to release an aroma, and looking browned, add salt, sugar, cinnamon, and cayenne pepper. Toss to coat and swirl over heat for another 30 seconds. Cool to room temperature. Combine Kale chips and seasoned nuts. Enjoy with your mango salsa and sangria! Next > Frito. Chili. Pie.